I was just browsing through my old files looking for significant works I may have done in the past and have bumped into this one oil painting, “On My Way to School“. It carries this title, since, because of this half-cut tree that I almost tripped on walking up across the park (located between the place where I lived and my school along Alameda Padre Serra also known as APS by people from Santa Barbara, CA), I decided not to attend my painting class under Prof. James Jarvaise, but paint this tree instead. It was a well-liked piece I did so I decided to include it for the school’s annual show at the end of the year. Because of this piece, I was inspired to do a series of works related to this theme which I entitled, “Inner-Light series” (wood-scapes). 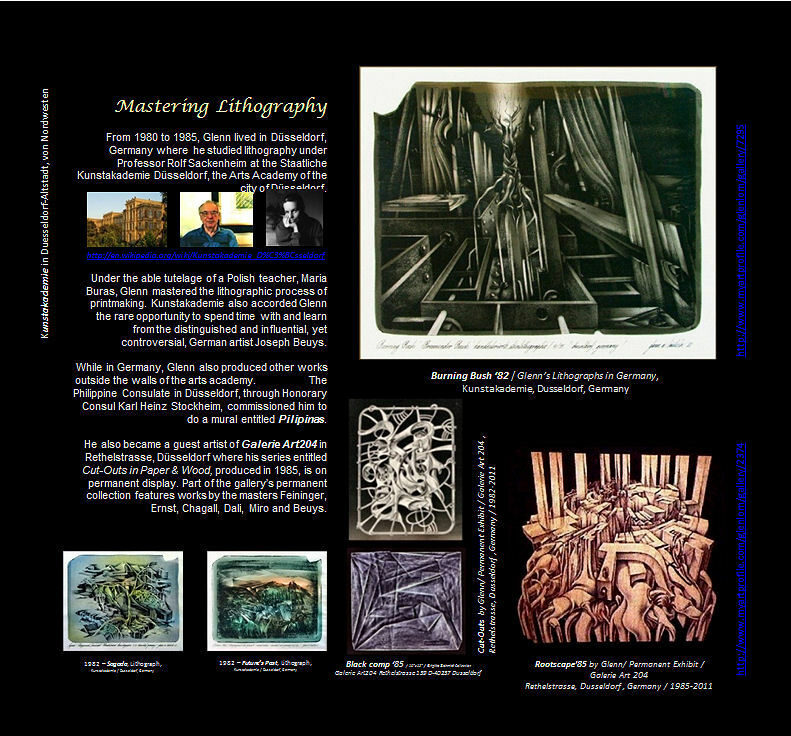 After two years of painting at Brooks, my works were included in a group show of artists from Santa Barbara – – John Cushing and Stephen Samejan, exhibited at the Santa Barbara Museum of Art (SBMA). It was Art Curator, Ronald Kuchta who made this significant group exhibition of three young artists from Santa Barbara a possibility. This group exhibition coincided with the Impressionist Master Childe Hassam’s Retrospective show at the Santa Barbara Art Museum (SBMA). 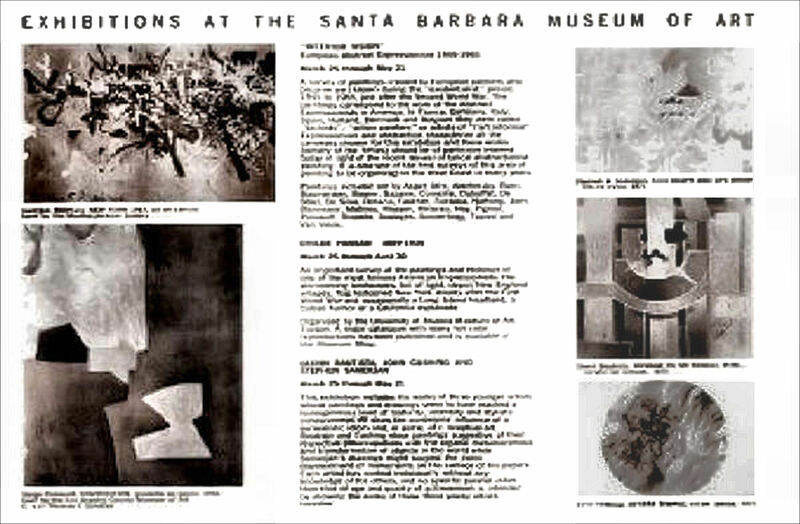 This is what Curator Ronald A. Kuchta wrote about Glenn’s works exhibited at the Santa Barbara Museum of Art. 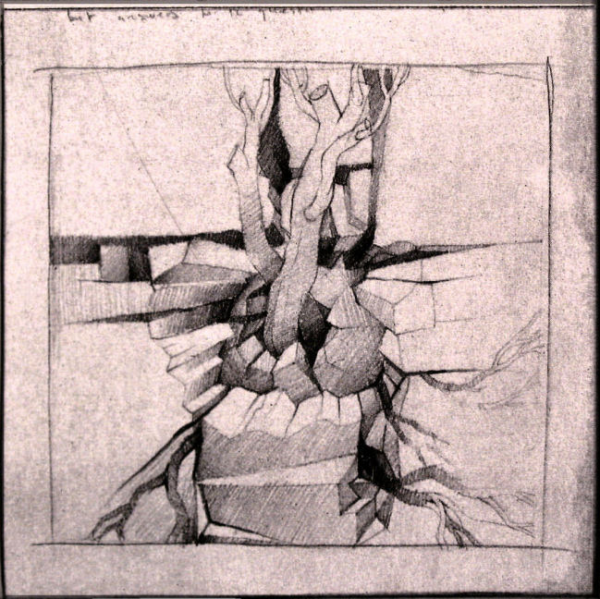 “Glenn’s works have reached a considerable maturity of aesthetic vision and technique. He expresses himself in contemporary idiom which owes much to surrealism and conceptual art” – Ronald A. Kuchta, Art Curator, Santa Barbara Museum of Art / 25 March 1972. Missed my painting art class with Prof. Jarvaise when I bumped into this half-cut tree – – walking to school across the park. I opted to sketch instead and headed back home to paint . 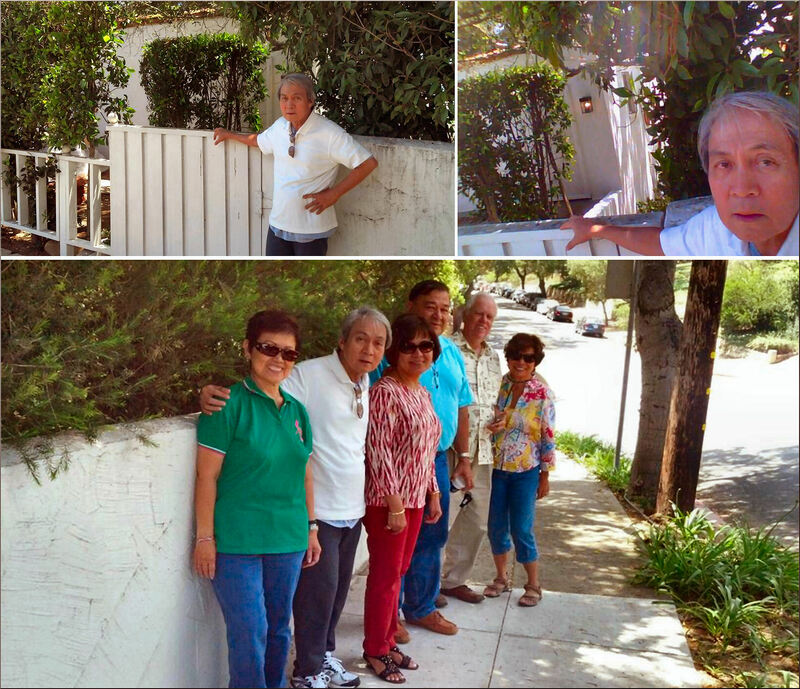 With my UHS mates (in front of my former art studio in Santa Barbara, California) – Before I even flew in to Los Angeles, somehow, Lynne Paulino Alba & husband, Jack, Mila Abesamis Emerson and Jane Love Alba, had already asked me about the places I wanted to visit during my two-week stay in California – a trip that was made possible by their invitation, and Brooks Institute of Fine Arts was one of those places. It wasn’t easy to find my former art studio and school, but eventually, my visual memory of those places brought us to the door of my art studio (during my student days in Santa Barbara, California). We did both, viewed the museum exhibit then ate somewhere along State Street, at a Mexican resto. 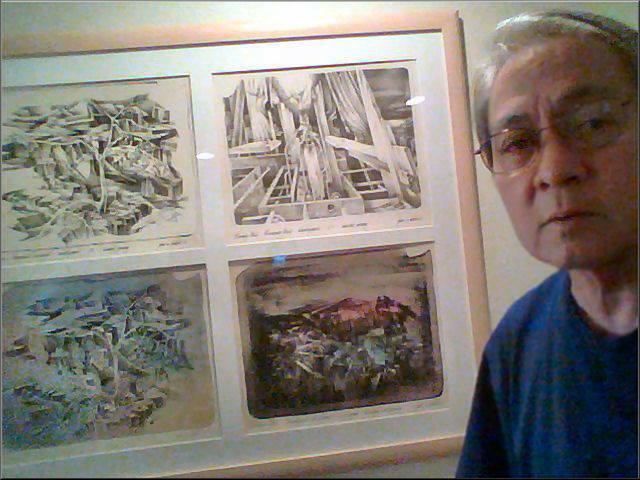 Glenn’s home-crafted Litho-press (“Pressy”), and two lithographs he editioned in Dusseldorf, Germany; and one of many lithographs produced in Paranaque, Philippines – making use of available local materials and wooden litho-press Glenn, together with Sonny and Tony created. Early morning tomorrow, I will have to go to the photo shop to get a film for my litho-drawing entitled “Coralscape“. Only after doing this can I go to the Kunstakademie to work on transferring it to the surface of the stone. 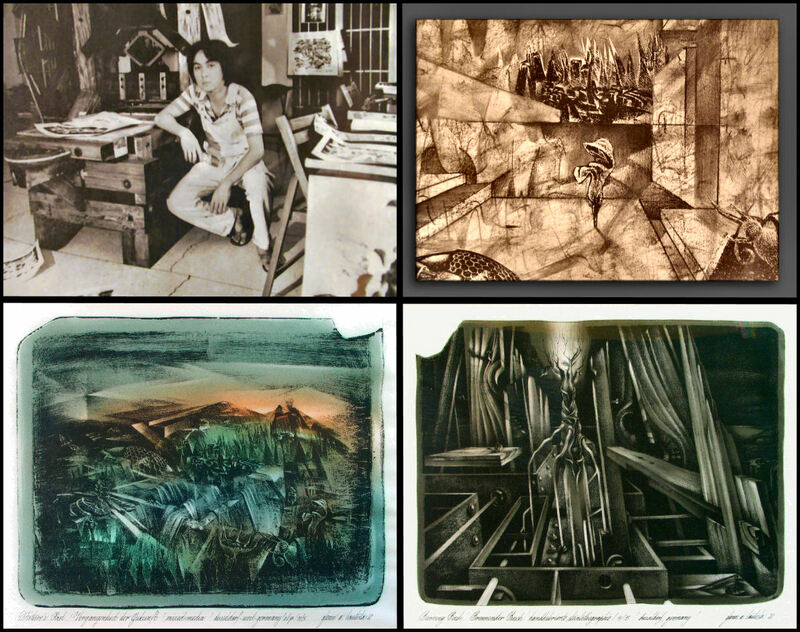 First, I’ll try to explain to you the simplest way I can what stone lithography is all about. We have here either a square or rectangular stone – – it is basically called a limestone. But, there are many types of litho-stones. Some are hard and some are soft. The harder stones are better to use. They are normally medium or light gray in color. With pencil or crayon, tusche or litho-kreide – – all contain some amount of wax or grease, I draw on the stone. So, can you imagine now a rectangular stone with a drawing on it? For lighter areas in the drawing, I use a number 5 litho pencil. As it goes darker, the pencil number goes down to 4, 3, 2, 1. Now we have the finished drawing. I will have to apply, rather carefully, a little amount of talkum so that the next chemical which is called atzgummi in German ( a mixture of gum-arabic, nitric acid and water) may be applied without destroying the drawing. Atzgummi will have to be applied quite thinly, if we have a very sensitive and light drawing. Otherwise, it will just eat up all the grease which is the drawing itself. After applying it, we must wait for it to dry. After the first application has dried up, we can now apply just a little more atzgummi and while still wet, wash it out with lithotine or turpentine oil. This will have to be done repeatedly until totally clean. By now, the drawing can only be seen quite faintly. Cornelin or asphaltum is now applied. This will help the areas to be printed, receptive to the ink later, as the atzgummi is there to resist the ink application. Here’s how it looks when we look at it more closely. After rubbing the cornelin on to the drawing, we can now, little by little, take it out with clean absorbent paper or cloth. After the stone is totally wiped clean, we may now, with a clean sponge and a lot of water wash out the cornelin. The drawing will now be more apparent. With a little bit of water layer remaining on the stone, we can now charge it with ink to prepare for printing, or, for the whole process, from the application of talkum, and on . .to be repeated for better stability in printing. I guess, I’ll have to go and get some sleep. It’s now 3:15AM. Tschuss ! In German , it means bye, so long, see you next time and many more. Monday, Dec 6, 1982 / 8:15PM – I came in about two hours ago and had eaten fried squid your mother prepared for me. It was really good. We had avocado for dessert. After meal, we lazily played one game of darts. You may learn about the game when you are big enough to throw the darts. For one to be able to play it well, one must learn to concentrate and have a lot of patience. I consider the game as form of medication. One has to be totally involved in playing it but in a very quiet and precise way. One has to practice regularly to focus in and hit the target. It is not quite different from life. For a lot of reasons, I have not been able to do what I planned to do last night. But just the same, I also worked hard this afternoon. It’s an earlier stone I was working on. 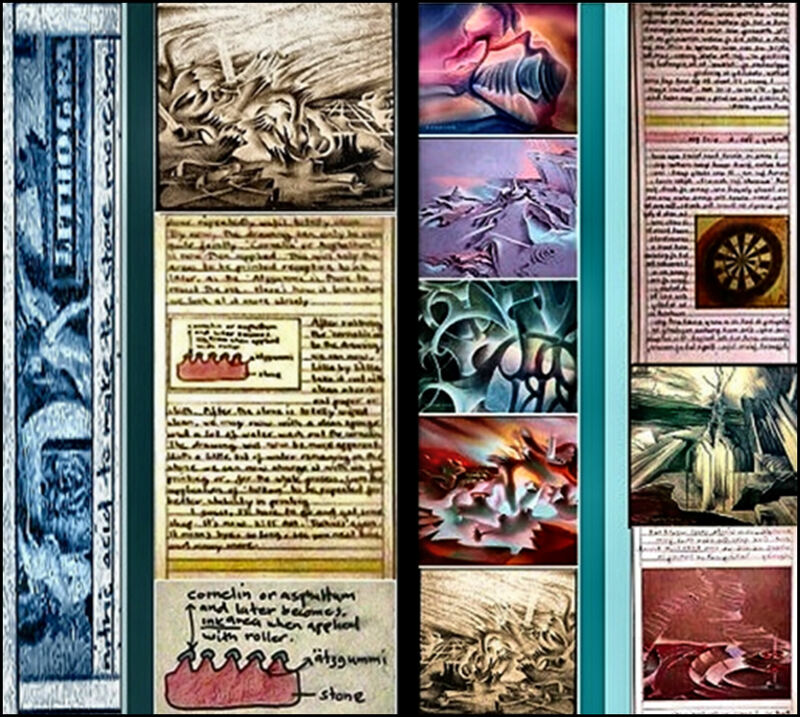 The artwork is entitle Persistence ’69. I’ll tell you more about it as soon as we’ve exhausted what I have to write about – – Coralscape. I have, in this drawing, departed from a small coral your mother chose to collect when we were in a beach in Cebu, Philippines. The beach is called Moalboal. There, we picked out a lot of shells, corals and other things from nature which were not perfect but, will be good subjects for drawing. Not too perfect, even the more imperfect and natural objects, are the more exciting objects to collect and draw – – just like a broken shell. If it’s perfect, it’s only the exterior that you see. Whereas if it is not, you would get a glimpse of how it is inside and understand more the form it displays. Also, being worn out and old, there seems to be something more about it than just a nice looking perfect shell. All the other elements, like salt, water, wind, heat and a lot more, have made it to what it is by the time you pick it up. A closer look at these natural objects would open one’s yes to infinity as if the details, like the inside of a shell, would not end. One gets the idea that from where we are, we both look towards infinity – – looking out or looking in. And so, I guess, as the line goes, nature is still our best teacher. It tunes us in and makes us one with the whole universe. It guides us to focus in and realize that we are not apart from them. The late National Artist, Cesar Legaspi, liked the piece, Coralscape so much, that I gave it to him as a gift for his birthday. 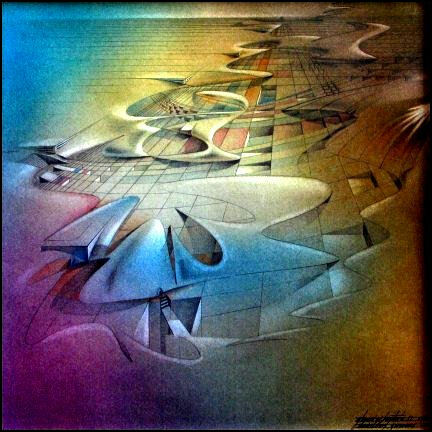 That old man was so humble that he even asked me, “Can you teach me how you go about your pastels?” I don’t normally give away my artworks, but, how could I have refused an art master, much more a dear friend and a Christian brother. God bless you, ‘Mang Cesar‘. 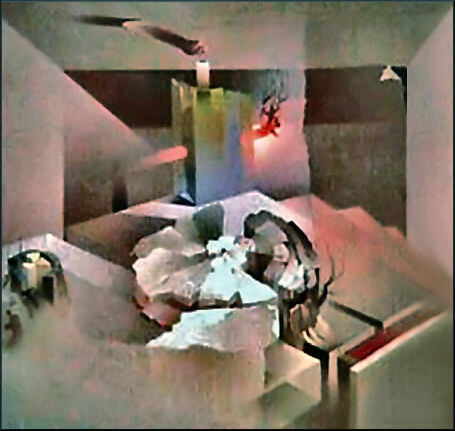 I was in Dusseldorf, Germany from 1980-85 just sketching, painting with pastel and oil, and a bit of woodwork – – all part of my Cut, Folded and Torn Series. Through the kindness and courtesy of Brigitte and Manfred Schmidt of Galerie Art204 (strasse) I was accepted as a guest artist where my works were properly framed by Manfred and exhibited together with my lithography professor’s works, Rolf Sackenheim and a few others of my favorite European Masters. Then, I had the urge to write in a very personal way, that I imagined writing to a fictitious daughter who I fantasized we would eventually have, being married to Ulli Tellbach, a homeopathie student, then, now a heilpraktiker. Looking back now, obviously, this did not materialize for I am now writing from Pearland, Texas with a Filipina wife, Lorna- – a physiotherapist. Our son, David is now busy and happy with his career in networking with Philippine Electric Corporation. 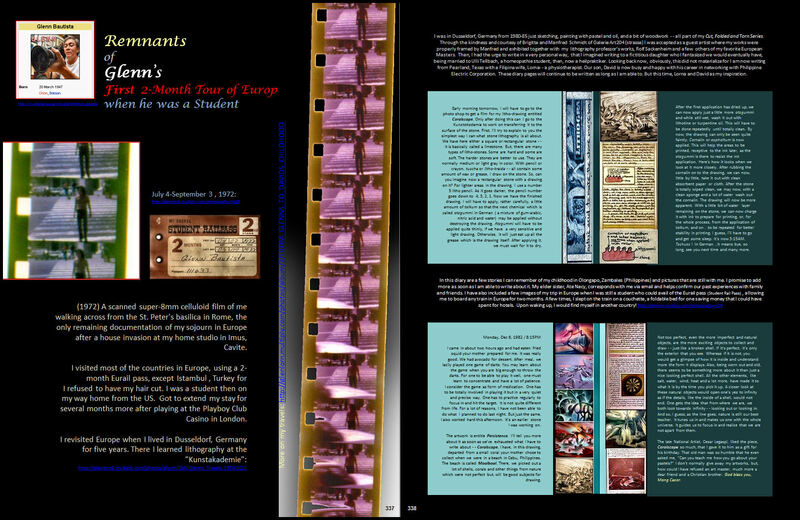 These diary pages will continue to be written as long as I am able to. But this time, Lorna and David as my inspiration. 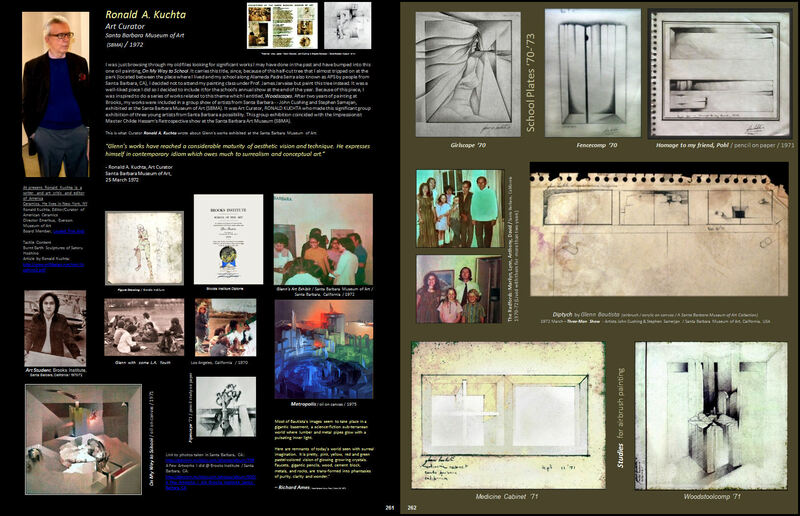 In 1970, under the Crusade Scholarships of the United Methodist Church, New York, NY, Bautista went to the United States to continue his art studies at the Brooks Institute of Fine Arts in Santa Barbara, California. After two years, upon the invitation of Curator Ronald Kuchta, he joined a Group Art Exhibition with John Cushing and Stephen Samerjan at the Santa Barbara Museum of Art. At the same time, the works of the Old Master Impressionist Childe Hassam were on display at the next gallery room. 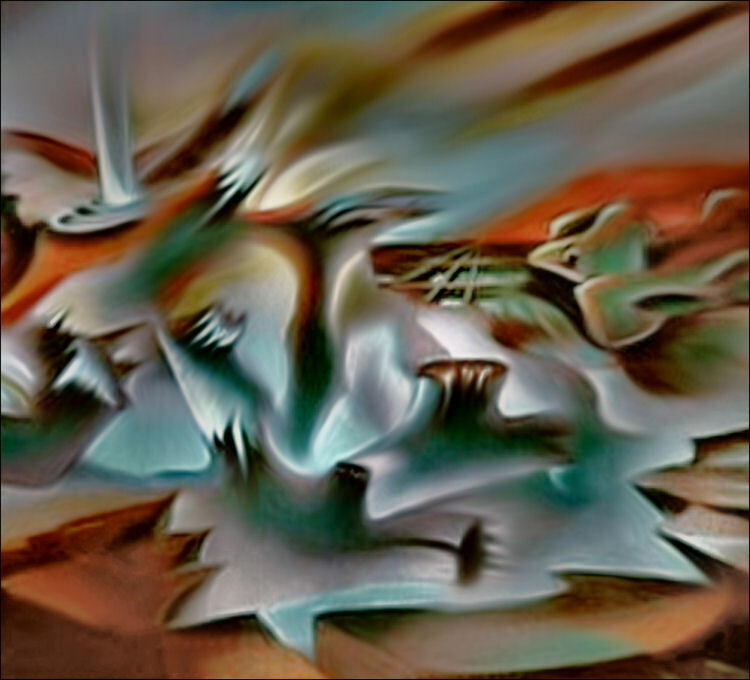 Glenn’s works consisted of abstractions in diptychs and triptychs done with the airbrush – – one of which, entitled “Diptych” he donated to the museum, now part of SBMA’s art collection. His participation at the Art Exhibit was critically acclaimed which earned him a Bachelor’s Degree in Fine Arts , Major in Painting, with honors. I was just browsing through my old files looking for significant works I may have done in the past and have bumped into this one oil painting, “On My Way to School“. It carries this title, since, because of this half-cut tree that I almost tripped on at the park (located between the place where I lived and my school along Alameda Padre Serra also known as APS by people from Santa Barbara, CA), I decided not to attend my painting class under Prof. James Jarvaise but paint this tree instead. It was a well-liked piece I did so I decided to include it for the school’s annual show at the end of the year. Because of this piece, I was inspired to do a series of works related to this theme which I entitled, “Inner-Light Series” (woodscapes). After two years of painting at Brooks, my works were included in a group show of artists from Santa Barbara – – John Cushing and Stephen Samejan, exhibited at the Santa Barbara Museum of Art (SBMA). 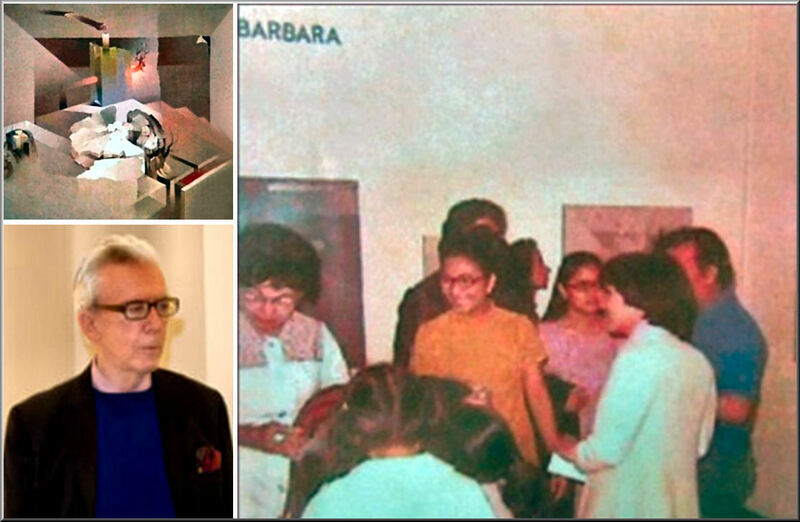 It was Art Curator, Ronald Kuchta who made this significant group exhibition of three young artists from Santa Barbara a possibility. This group exhibition coincided with the Impressionist Master Childe Hassam’s Retrospective show at the Santa Barbara Art Museum (SBMA). 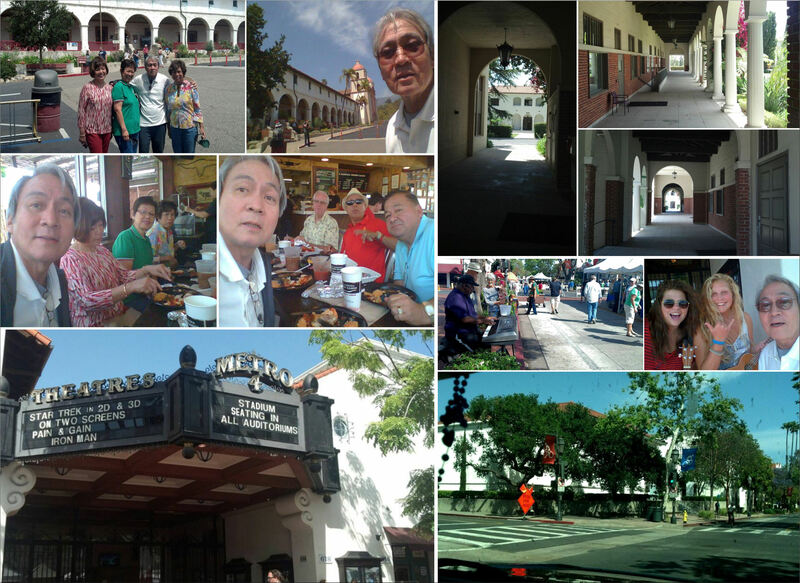 September 28, 2013 – Maria Antonieta Vasquez Salazar, Joe Galvez, Benny Uy, Mavi David, Patt Alejo-Nievera, Louie N Jane A, David Bautista, Lcristina Bautista, Rodolfo Samonte, Camero Celeste Breeze, Arthur Belarmino Uy, Phillip Ner like this. Glenn A. Bautista: Naku, Arthur, nabisto na ang usapan namin ni Benny bro . . . lagot ka ngayon, Benny! Glenn A. Bautista: Arthur, d truth will be revealed after you watch d video . . . laking gulo nito! Glenn A. Bautista: Hala ka, lalo kang lagot, Benny bro . . .
Ribbon-cut by Mrs. Baby Angara. 2nd image – Artist Glenn with Pres. Fidel V. Ramos, a fellow Rotarian – Manila Hotel. 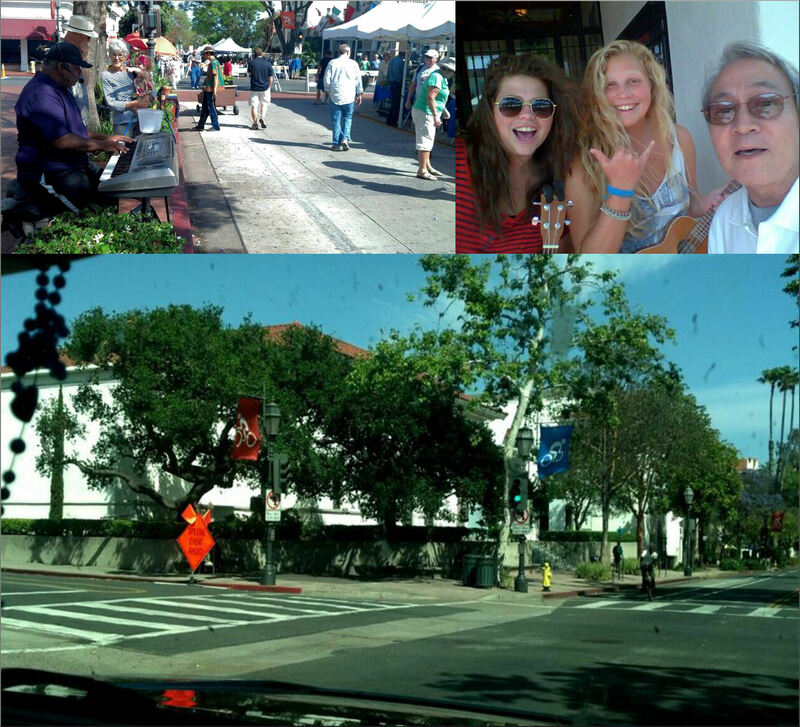 Glenn A. Bautista: My trip to Santa Barbara, CA, together with Lynne & Jack, Mila & Clyde, Lydia and Ed. UHSmates ’63 – Thank you so much for your thoughtfulness, support and appreciation. 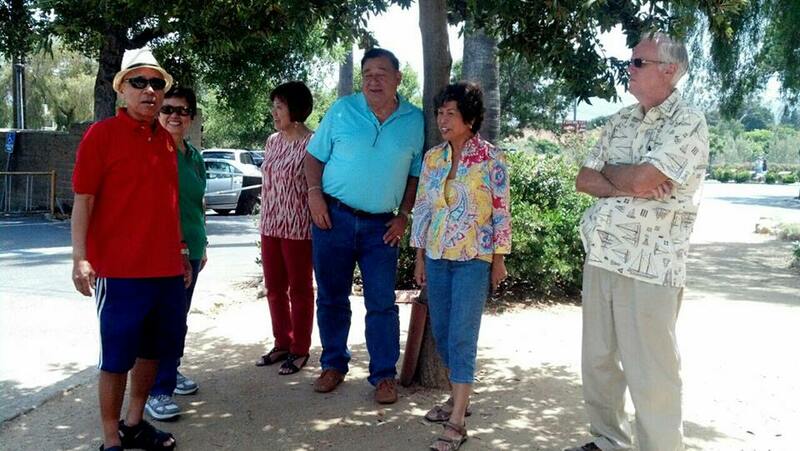 Mary Ann Sagarbarria, Susan Zurek, Joanie Veza, Rick Protacio, Edgar Inocentes, Louie N Jane A, Arthur & Connie Abrantes, Lory Faye, Missy Pearson, Brian Alvin, David Bautista, Maria Antonieta Vasquez Salazar, Leslie Bocobo, Imelda Angeles Reantaso, Ablaza Oscar and 6 others like this. Glenn Bautista: Thanks, Willie . . trying my best to learn this WordPress app. I’m getting there. Take care. Willie B. Laureano: I Love this series Uncle Glenn. 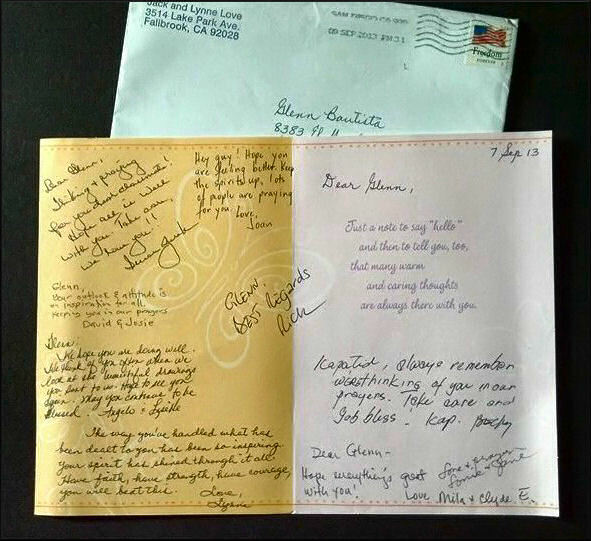 Willie B. Laureano: Take care Uncle! 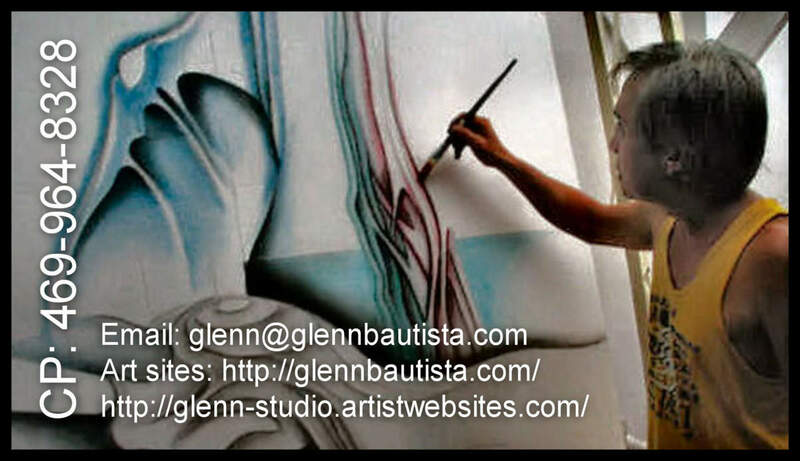 Glenn A. Bautista: Please help complete – – > link, artwork, portrait of Efren Lopez. Artists featured may submit another portrait, artwork or link. Rodolfo Samonte: Galing, Glennbro. Maraming salamat. 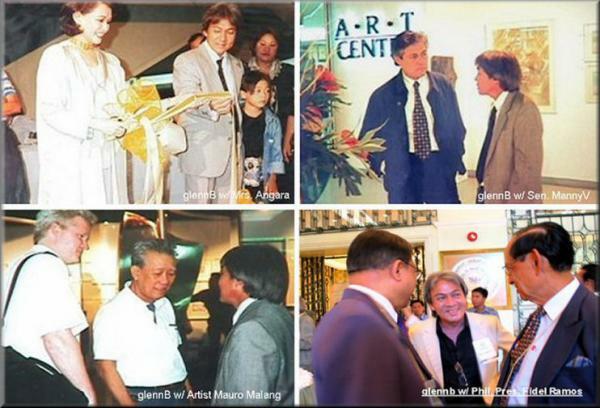 Glenn A. Bautista: RodS, the least I can do for our great Pinoy artists . 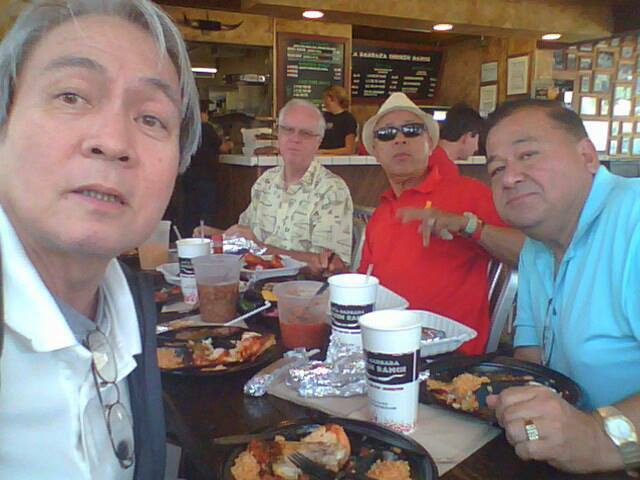 . . Rod pala, do you have portrait or artwork images and links of Manny Soriano & Efren Lopez? Kulang pa kasi ito . 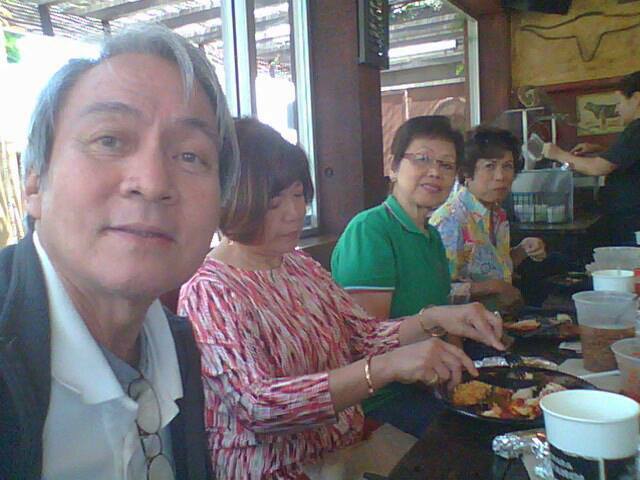 . .
Mitch Samonte: Glenn, i used to work with Manny Soriano at Design Center Phil, where I also met Rudy, my husband. Ang galing niyang artist din. Glenn A. Bautista: That’s good to know, Mitch . .
Nestor Olarte Vinluan: excited ako sige lets talk …that would be great if most of us thirteen if not all! Rodolfo Samonte: May mga pumanaw na, Nestor. Ikaw nandiyan sa Pinas. Pwede mong sigurong asikasuhin. Siyempre sa CCP ang exhibit. I’ll be in Manila early next year around February. Baka pwedeng itaon around that time, hehehe. Glenn A. Bautista: Sige, NestorV, RodS . . pave the way for this exciting exhibition of the 1974 Thirteen Artists. I am quite ready for artworks to exhibit. A matter of flying back there to dear Pinas . . . RodS bro . . sino yung pumanaw na? 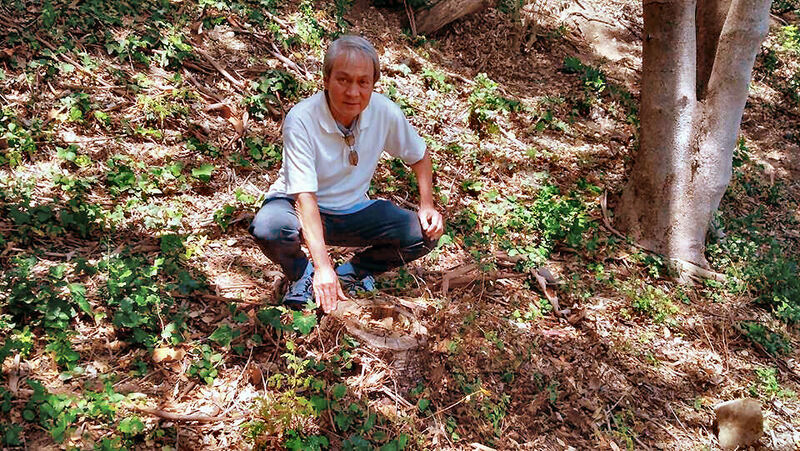 Nestor Olarte Vinluan: will put that in mind…will try to trace and keep in touch with our thirteen of 1974 habang physically present pa pero pwede pa rin naman mask slaws na todits sa physical plane baka borrow na lang …problem though kung ccl medyo di basta madali ang sked,so with the good galleries …will see mga bro..! Glenn A. Bautista: Ok, NestorV, it’s good to hear from you after all these years . . .
Rodolfo Samonte: Glennbro, si Manny Soriano passed away. Glenn A. Bautista: Ah, ok, RodS . . kelan? Rodolfo Samonte: oh, not sure maybe 4 or 5 years ago. Glenn A. Bautista: Ok, thanks, RodS, NestorV, . . we should have our 1974 Thirteen Artists’ Reunion Art Exhibit soon, bago mabawasan pa, hehe . .
Rodolfo Samonte: Baka sa UP Vargas museum pwede. Malakas si Nestor doon. Dating Dean. Glenn A. Bautista: Pwede rin . .
Rodolfo Samonte: At taga UP ka pa, Glennbro. Dindo Angeles: …magkikita tayo sa labas ng CCP. Rodolfo Samonte: Eto pala si Dindo. Anong ginagawa mo ngayon Dindo? Dindo Angeles: Rudy, directing pa rin, pero ng mga ads. Walang theater muna. Naghahanda para sa isang film project. Ikaw, kmsta? Rodolfo Samonte: Okay lang, still in the arts. Rodolfo Samonte: Yes, tuloy natin, masaya yun.